New York’s legendary Café Society nightclub debuted in the Greenwich Village of the late 1930’s. For many years that followed it would be the Mecca for many African American jazz greats who would pass into legend themselves. Club founder, Barney Josephson, was of a Jewish family that had fled Hitler’s Nazi Germany years earlier. He had a flair for attracting great jazz talents of the time, but also a liberal political mentality that put him and his club at odds with the growing conservative crusaders that would culminate in the “red scare” of the Joseph McCarthy era. 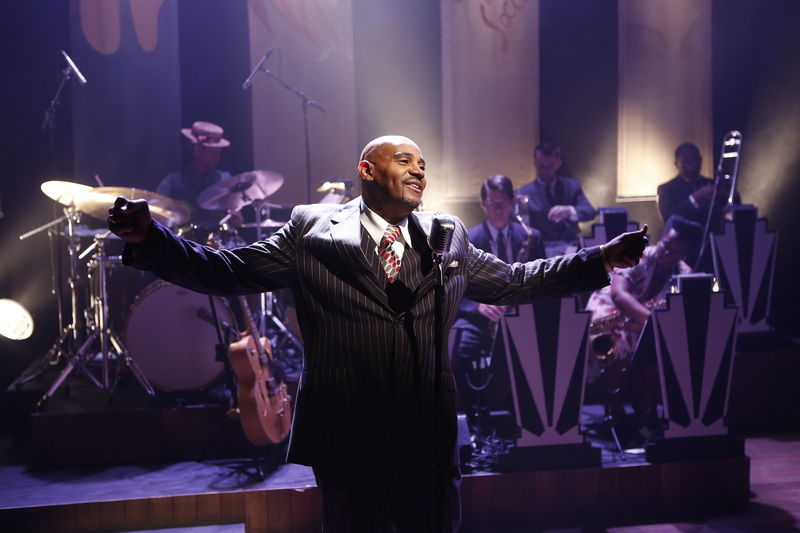 The story is now exquisitely and musically told in the 59E59 Theaters production of, CAFÉ SOCIETY SWING, by Alex Webb with brilliant direction from Simon Green. The number quickly evolves into a showcase of instrumental virtuosity that hints of the many solo moments to come for guitar, drums, bass, tenor sax, alto sax, trumpet, clarinet, and trombone. It would be a feast of musicianship as the evening progressed. While Webb dazzles on piano during the tune, “Rollin’,” Miss Wade arrives elegantly onstage in a gown of ruby-red with the color of fine wine. (The show’s beautiful costumes, and the playful set murals that poke fun at high society come from designer, David Woodhead.) 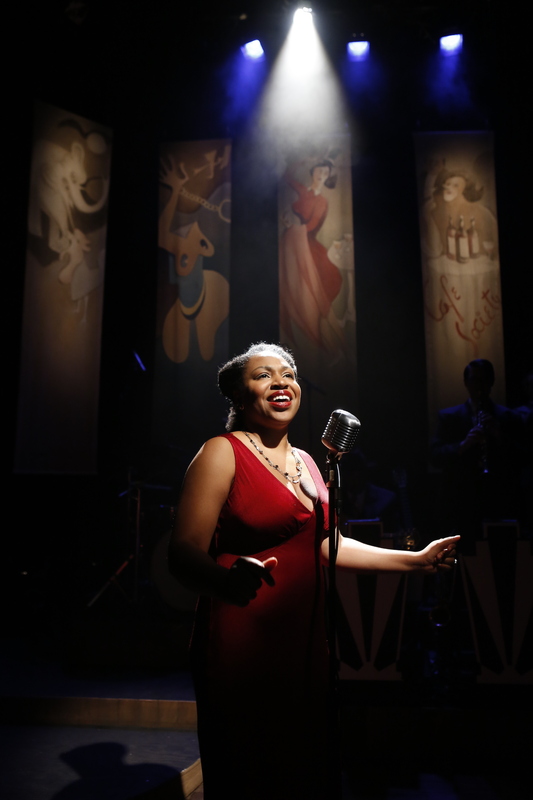 With Harris on sparkling guitar, Wade launches into her smooth and splendid opener, “What a Little Moonlight Can Do,” and follows with an equally splendid, “All of Me.” The show is really “rollin’” now! Next, looking like a delicate doll, the lovely and demure Miss Aimée takes the stage in a glittering gown of gold satin with shimmering bracelet to match. Better still, she brings a voice of pure gold to her coy representation of a fair-skinned black vocalist of the day whose coloring was sometimes derogatorily referred to as, “high yellow.” It was Lena Horne, and Aimée’s bright interpretations of “Stormy Weather,” and “Where or When,” both beautifully capture the vocal stylings of Miss Horne. Propelling the plot line of growing political suspicions about those deemed to be “left-wingers,” we have a deft performance from actor, Evan Pappas, as a kind of investigative reporter assigned to dish the dirt on this suspicious nightclub that dares to allow blacks and whites on the same stage, not to mention permitting mixed races in the audience. His skillful narrations serve as asides to the audience and help clarify the ongoing controversies that will eventually consume the club sometimes known as “the right place for the wrong people.” (Our four lead singers skillfully join forces for the smooth harmonies of the politically charged quartet, “Stalin Wasn’t Stallin’.”) Lighting designer, Maruti Evans, beautifully creates the smoky back rooms of the press office, and shows equal skill in knowing when to throw a misty spotlight on both singers and instrumental soloists. Job well done! Great renditions of “Closing Time,” and “I Left My Baby,” wind down an Act One that goes out with a bang during a “Society Jump,” that has the whole room jumpin’ to numerous fine instrumental solos. 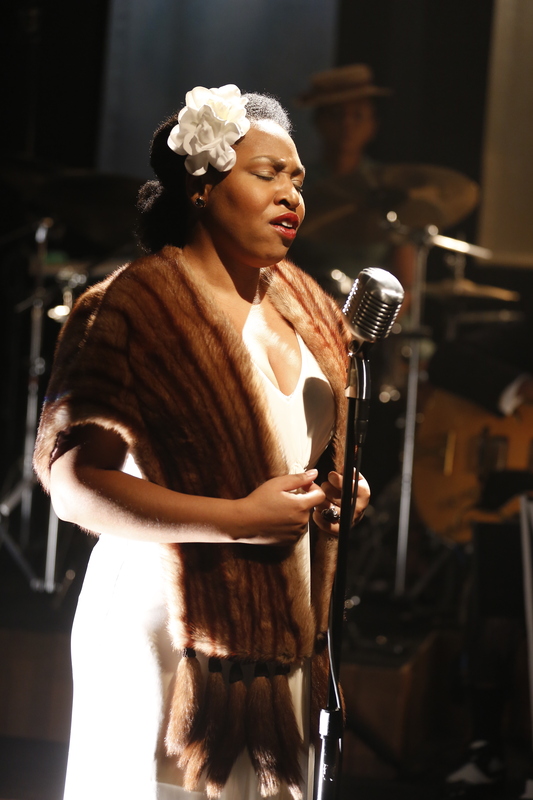 Maybe the show itself is just too hot for words, and if you don’t believe me just wait until you see Miss Wade channel Billie Holiday as she closes the show with a sensational and never-to-be-forgotten, “Strange Fruit.” With incredibly gifted vocalists and musicians, Café Society Swing works on virtually every level while recreating a golden musical age. I predict a word-of-mouth sellout, so readers beware. 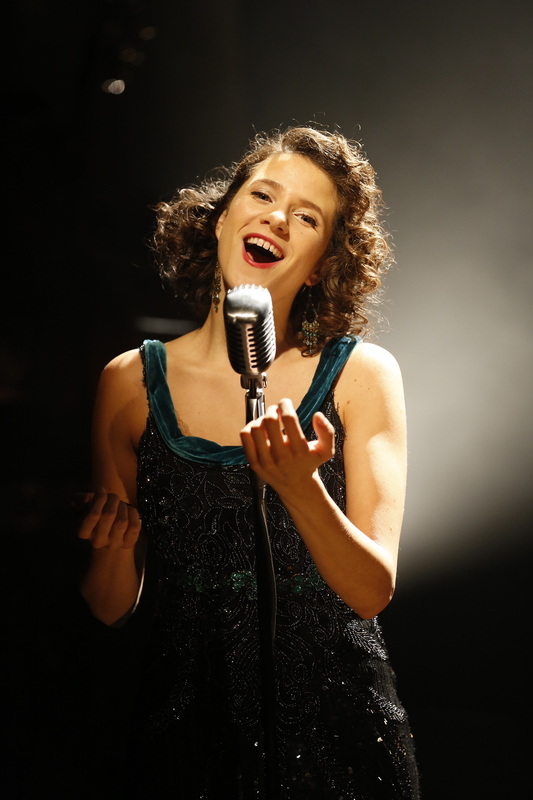 CAFE SOCIETY SWING continues this limited engagement through January 4, 2015 at the 59E59 Theaters (59 East 59th Street, between Madison and Park Avenues). 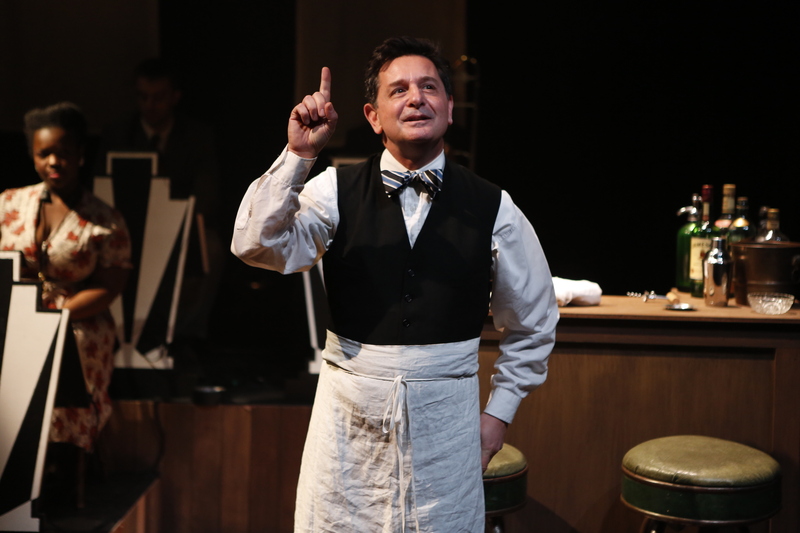 The performance schedule is Tuesday – Thursday at 7 PM; Friday at 8 PM; Saturday at 2 PM & 8 PM; Sunday at 3 PM & 7 PM. Please note the following holiday schedule adjustments: There is no performance on Thursday, December 25; there is an added performance on Friday, December 26 at 2 PM; the performances on December 24 and December 31 are at 6 PM. Single tickets are $70 ($49 for 59E59 Members). To purchase tickets, call Ticket Central at (212) 279-4200 or visit www.59e59.org. This entry was posted in 59E59 Theaters, Barney Josephson, Billie Holiday, BroadwayStars.com, Cafe Society Swing, Concert Reviews, French Jazz, House Un-American Activities Committee, Lena Horne, Nat King Cole, Nightclubs, Off Broadway, Sarah Vaughn, Theater Reviews, ThePeoplesCritic.com and tagged 59E59 Theaters, Billie Holiday, Cafe Society Swing, concerts, House Un-American Activities Committee, Lena Horne, musicals, Nat King Cole, nightclubs, Off Broadway. Bookmark the permalink.